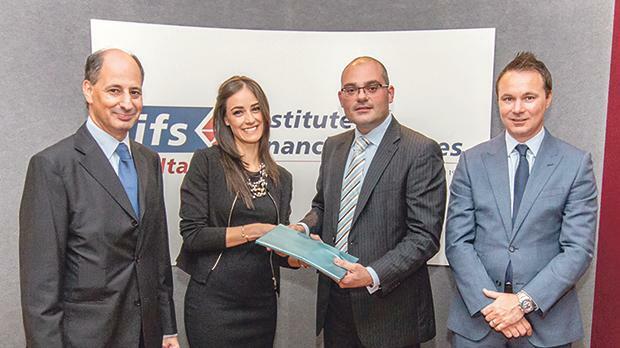 Daphne Ciantar receiving a commemorative gift from IFS Malta president Kenneth Micallef in the presence of Peter Calleya, IFS Malta vice president (left) and Rob Thompson, relationship director at the London Institute of Banking and Finance. Maltese banker Daphne Ciantar has been awarded a prestigious international scholar prize by the London Institute of Banking and Finance in recognition of her academic achievement while completing the BSc (Hons) in Banking Practice and Management. Ms Ciantar received the highest mark in the Advanced Based Work Learning module of the degree course, which had a particular focus on financial crime, risk and compliance. Rob Thompson, relationship director at the London Institute of Banking and Finance, congratulated Ms Ciantar and commended her for her achievement, while wishing her further success in her career and future studies. Ms Ciantar has been working in the financial services sector since 2007 and is currently a senior credit officer at HSBC Bank Malta’s Lending Services. She also holds a Foundation degree in Banking and Finance from the University of Kent and a Diploma in Management Studies from the University of Malta.